The atmosphere consists of an ocean of air, extending out to 1,000 km from earth's surface (or about one-seventh earth's radius). All weather processes take place in the lowest 10-15 km of the atmosphere. This is called the troposphere and its upper boundary is called the tropopause. Pressure falls with height, from about 1,000 hPa (hectopascals) at the surface to about 200 hPa at the tropopause. Temperature also generally falls with height throughout the troposphere, at an average rate of about 6°C/km. The sun's radiation is the source of energy that drives the weather system in the troposphere. The weather systems are devices that spread the solar energy from the equator towards the poles. Note that the earth's mean temperature does not change significantly, so there must be a balance between the energy absorbed from the sun and the energy re-radiated to space. This solar energy is then distributed around the world in a variety of ways. Heat and moisture are the two prime causes of all weather conditions. Except for localized factors such as bushfires, volcanoes or nuclear explosions, the heat source for the earth's weather is the sun. The land masses, which heat up quickly and cool equally quickly, produce heat radiation into specific areas. The sea, which retains its heat for much longer periods, results in constant temperature over vast areas with consequent heating of air from cooler regions or the cooling of warmer air from lower latitudes or land masses. The moisture source is, of course, the sea and the combination of the sun's heat and the resultant evaporation of the sea surface produces the moisture content in the air. When air is warmed it becomes lighter and rises. This lighter air registers as a low pressure on a barometer, which measures atmospheric pressure or the ‘weight’ of the air. Cold upper atmosphere air sinks because it is heavy and registers as ‘high’ pressure on the barometer. Large areas of high and low pressure are represented on a weather chart as successive high and low pressure systems. Air will always flow from high to low pressure and it is this air movement that we know as wind. The difference in pressure over a distance is the ‘pressure gradient’ and directly affects wind strength. If the difference in pressure over a particular distance increases the pressure gradient is said to become steeper and the wind will strengthen. Pressure gradient is represented on a weather chart as the distance between the isobars. The fourth element, clouds, is both cause and result. They result from the upper movement of moist air which condenses on reaching the cooler upper atmosphere, this air is condensed into droplets of water which form around dust or salt particles to form visible clouds. The effect of clouds on the weather is twofold. 1. The degree of cloud cover will restrict both the heating effect of the sun and the earth's ability to radiate heat outwards. As such they can be the cause of keeping an area cool or warm. 2. The effect of the latent heat released into the atmosphere during the condensation process and the subsequent precipitation in the form of rain. Weather can be defined as the state or condition of the atmosphere at a particular time and place and as mariners; we will be interested in present and future weather conditions in our area of operation. To get this information we can access several sources. One way is by weather reports or forecasts broadcast by local radio stations, or published in newspapers. However, as most vessels are equipped with either or both, VHF and HF radios, weather information can be readily obtained via "Coast Radio Stations" through the regular weather and traffic schedules. Generally twice a day for coastal weather forecasts and twice daily for high seas (offshore) forecasts. Weather information is also available on demand from coast stations. Mariners should make themselves familiar with the frequencies used by these stations, schedule times and procedures required to access them correctly. Forecasts issued in the mornings cover the remainder of the day, until midnight. Afternoon forecasts cover 24 hours from 1800. Forecasts issued at other times are usually for 24 hours from the time of issue. The pressure, or weight, of the atmosphere is measured by a barometer. This pressure is expressed as hectoPascals (hPa) and visually presented on a weather map by Isobars, which are simply lines joining places of equal pressure. The heat content of both the air and sea measured by a thermometer and expressed in degrees Centigrade or Celsius, can be visually presented on weather maps by lines called Isotherms. Isotherms are generally only included on upper atmosphere charts and not on MSL charts. The quantity of water vapour in the air, measured by a Hygrometer, is called relative humidity and is expressed as a percentage of the maximum amount of water that the air could hold (saturation). The surface movement of air is called wind, and is measured in knots over the water and in kilometres/hour over the land. Its direction is determined by the direction from which it is blowing. Strength is gauged visually or from an anemometer and can be visually presented on a weather map by symbols or in knots. To achieve this a large number of observations need to be made simultaneously over a wide area. These observations come from weather ships, meteorological stations, automatic weather recording stations, port meteorological officers, airport meteorology offices, co‑operating marine observing vessels and aircraft. They are then coordinated into an area chart. The major pressure systems are driven by the sun and as the sun apparently moves north and south throughout the seasons the pressure systems go with it. Fig 4.1 is a typical summer map. Note the anticlockwise air flow around the high in the ‘Bight’ giving south-east trade winds along the east coast. Also note the equatorial trough present across northern Australia. The pressure gradient along the equatorial trough is notoriously weak giving rise to light wind conditions known as the doldrums. Fig 4.2 is a typical winter map. Note the absence of the monsoon trough which has moved into the Northern Hemisphere. The high pressure systems now take a line through central Australia taking the south-east trade winds into northern Australia. South of the line of the high pressure systems the wind driven by the pressure systems (gradient) is predominantly west to south-west. Southern Australia wind is also affected by intense low pressure systems and cold fronts associated with the ‘Polar Front’. These cold fronts extend as far north as south-east Queensland through winter. Atmospheric Pressure: The force exerted by the atmosphere on each unit of area. This can simply be thought of as the “weight” of air. The unit used today is the hectoPascal, where 1 hPa equals 100 Newtons per square metre. Isobar: A line on a weather map which joins places having the same atmospheric pressure. Used to determine the direction and strength of the wind. Pressure Gradient: A measure of the rate of change in atmospheric pressure with distance. The closer the isobars are together, the higher the pressure gradient is and the stronger the winds will be. Anticyclone or High: ­An area of high atmospheric pressure within a closed (circular) system of isobars. An anticyclone is a region where a system of isobars encloses a centre of high barometric pressure. The centres of anticyclones are generally areas of light winds, little cloud and good weather. Ridge: An area of high pressure extending into or penetrating an area of low pressure. A Ridge of high pressure may extend out from an anticyclone. Depression, Low or Cyclone: An area of low pressure within a closed system of isobars. Trough: An area of low pressure extending into an area of high pressure. A trough of low pressure may extend out from a depression. Cold Fronts and Line Squall: A front is named by the active or moving air mass. Thus in the case of the cold front, it is the cold mass of air that is moving. As the cold air pushes into a warm air mass the warm air is pushed up and cooled. If this uplift occurs rapidly and there is sufficient moisture in the air, storms and squalls may occur. At other times the passage of a cold front may only be marked by a sudden change in wind direction to the south. Often a cold front is sandwiched between two high pressure systems and indicated by the saw tooth line on the weather map. The typical weather prior to and after the passage of a front is described in conjunction with Fig 4.3. 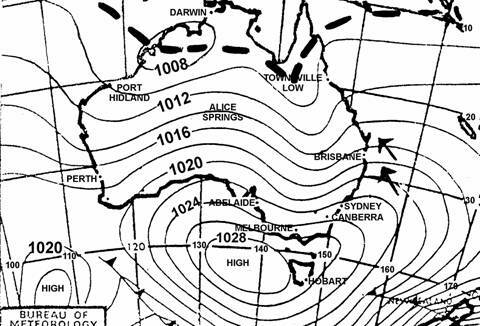 Preceding the front (from Position ‘A’ along the central NSW coast): As the high pressure system moves away, the gradient wind turns warm northerly and the backs into the north-west as the front approaches from NSW. The barometer will be steadily dropping over two to three days as the high moves away and often the pressure gradient will become steeper within six to twelve hours of the front, with north-west winds increasing to perhaps 25-30 knots. At the front: The northerly wind will back right around into the south-west or the south-east. The barometer will be at its lowest. If a storm accompanies the change prepare for severe weather. After the front: As the next high pressure system takes over, the wind will settle into the south and be much cooler. The barometer will begin to rise and the strength of the wind will depend on the pressure gradient. On the accompanying barograph trace (Fig 4.4) from coastal south-east Queensland, note the diurnal variation, steady drop in pressure as the front approaches, sudden jump as the storm comes though, then the steep pressure gradient following the front. A line squall is the name given to an extremely active or severe Cold Front. This is another way of saying that the temperature difference between the cold and warm sectors is large and that the warm air mass is extremely unstable. Convection along the front is massive. The line squall might not be forecast because the intensification of the front occurs during its passage. Any sharp Cold Front must be regarded with caution and a close weather watch maintained. The line squall is often accompanied by a long low black "Roll Cloud" stretching across the horizon in advance of the front. This is caused by the rapid advance of the cold sector forcing the air in the warm sector at the front to be tumbled over. The warm air being close to saturation, condenses out. Backing and Veering: A wind is said to back when its direction changes in a counter-clockwise direction eg. from West to South. When it changes in the opposite direction it is said to veer. Diurnal Variation: The atmospheric "tide" which causes the pressure to be lower at about 0400 and 1600 local time, and higher at 1000 and 2200. It should be taken into account when considering whether the pressure is truly rising or falling. Diurnal variation is about 4 hPa. Angle of Indraft: The angle at which the wind crosses the isobars. It results from a balance of Pressure Gradient Force, Coriolis Force and Friction. The angle of indraft varies from approximately 45° at the edge of a storm to 0° in the eye of a cyclone. Tropical Cyclone or Tropical Revolving Storm: An area of intense low pressure which may form over tropical waters, usually in the summer months. Trade Winds: In Australia this refers to the South-Easterly winds which are the prevailing winds along much of the Eastern seaboard. They are caused by the movement of air from the sub tropical high towards the equatorial. Pressure and Wind: Wind blows from areas of high pressure to areas of low pressure. The pressure gradient is an indicator of the speed of the wind. On a rotating earth, the wind direction is deflected to the left in the southern hemisphere. As a result, wind blows round areas of high and low pressure. In the southern hemisphere this direction is anticlockwise round a high, or anticyclone and clockwise round a low, or cyclone. Note that the wind diverges from the centre of a high and converges towards the centre of a low. 1 .There may be a lag between the wind getting up and the corresponding sea state. 2. The Beaufort scale assumes open ocean, with plenty of fetch. 3. Off a weather shore, the sea state will be less than expected. 4. Don't confuse sea and swell. 5 .A weather tide will cause more 'lop'. A lee tide will reduce the sea. 6 .Heavy rain smooths the sea surface. Ripples with the appearance of scales, no foam crests. Small wavelets. Crests do not break. Large wavelets. Crests begin to break. Scattered horses. Moderate waves. Many white horses. Some spray. Large waves. Extensive white foam crests. Spray. Sea heaps up. White foam begins to be blown in streaks. Moderately high waves. Crests begin to break. High waves. Dense streaks of foam. Crests begin to roll over. Spray may affect visibility. Very high waves. Tumbling sea. Surface mostly white. Visibility affected. Exceptionally high waves. Small and medium vessels sometimes lost to view. Air filled with foam and spray. Sea completely white. Visibility very seriously affected. Wind direction is estimated by wave direction. If you use the relative wind (eg. funnel smoke) you must make allowance for the vessel's speed. Visibility is difficult to estimate at sea, unless there are echoes on your radar. Fog is visibility less than 1 km. Mist is more than 1 km. It is smaller and cheaper than a mercury barometer, responds quicker to small changes in pressure, but is not so accurate. An aneroid should be compensated for temperature changes by the manufacturer. It does not require correcting for changing latitude. An aneroid should be checked occasionally against a standard barometer, which might be a mercury barometer or a precision aneroid by contacting the Bureau of Meteorology. An aneroid should be located where it is not liable to shocks or temperature changes, and out of direct sunlight. Tap gently before reading. The Barograph is simply an aneroid barometer with a pen arm recording on a clockwork drum with a paper chart on it. It provides a very useful record of barometric pressure. As the sun heats the land, air in contact with the land is heated and rises. Air over the adjacent water remains a comparatively cooler temperature and flows onto the land to replace the air that has risen. The wind that flows in from the sea is called the sea breeze, it is temperature driven and will attain maximum strength about mid-afternoon. As the heat goes out of the day the sea breeze will become gentle towards evening. If there is very little pressure gradient the sea breeze will generally average 15-18 knots and will not extend more than 20 miles from the coast. At night the opposite effect occurs. As the land cools down the cool air flows downhill off the land and out to sea to displace the comparatively warmer air over the water. This land breeze (flowing off the land) is usually fairly gentle (4-6 knots) and does not extend far out to sea (5-10 miles). Remember that daily weather patterns are localized. Check with your master/facilitator for local weather patterns in your area. If the gradient or trade wind is onshore the sea breeze effect can strengthen it and turn it more onshore in inshore areas. However, the most important effect for coxswains working along the coast is the land breeze during the early morning. As the air closest to the ground cools it settles in layers like a thick blanket that may only be a couple of hundred metres thick. Along the coast and over the land the warmer gradient wind flows over the top of this layer. This layer is known as an ‘inversion layer’ and will exist until the sun begins to heat the land and restores the normal vertical temperature profile in the atmosphere. Coastal waters forecasts will often mention trade winds being ‘lighter inshore at night and in the early morning’. Also late at night in the moonlight look for low level clouds moving much faster than the air speed at ground level would suggest as evidence of this effect. 1. Coast radio stations will be issuing frequent and regular warnings, including the best information available, of the position of the centre and its expected movement. 2. A definite, unusually steep fall in the barometric pressure. If the corrected pressure is below more than 3 hPa below normal, beware! If it is more than 5 hPa below normal, there is probably a storm within 200 miles. When checking the barometer to see if it is below “normal”, it is essential to take into account the diurnal variation. 3. Appreciable change in the direction and strength of the wind. 4. Unusual clarity of the atmosphere, remarkable visibility. 5. Extensive high cirrus cloud, swirling in towards the storm centre, and reflecting lurid colouring at sunrise and sunset. 6. In the open sea, swell from the direction of the storm centre. 7. High humidity and rain increasing as TRS approaches. A Coxswain operating close in along the coast should, upon hearing a cyclone warning for that area, proceed without delay to the nearest port, cyclone anchorage or safe haven. Port authorities in cyclone affected northern Australian ports have Cyclone Emergency Plans in place. Should you make for a port with which you are not familiar you should contact the Harbour Control on VHF for advice. Should you enter a port or a haven which does not have a cyclone plan, avoid anchoring amongst other boats if possible. If one drags it usually picks up a few others. If possible go as far as possible up a small creek and secure fore and aft, and athwartships to stout mangroves. Mangroves provide a tremendous wind break without being too high. Also, make allowance for ‘storm surge’ and ensure there will be sufficient water to get out after the storm. If at sea and the cyclone forms rapidly in the immediate vicinity, secure for heavy weather and make for the nearest haven. Also, if scheduled weather reports do not confirm the weather in your area, advise a Coast Station and other vessels of the conditions being experienced. Should conditions become severe, maintain regular contact with a Coast Station or Volunteer Rescue group. In addition to knowing where the storm is it is essential to secure the vessel before the onset of heavy weather. · Does the area provide shelter from the prevailing and expected winds? · It must be easily accessible. · Sufficient depth of water at all levels of tide. · Good holding ground if intending to anchor or a secure mooring point capable of mooring the vessel with chains or wire. · Distance of the safe haven from your present position. · Estimated Time to reach the haven in the prevailing conditions. · Is it in the likely path of the storm? · Effect of a storm surge in the haven. · Any submarine cables or ordinance areas that make the haven unsafe.